Staying calm in the face of fire, Disaster Management Minister Anura Priyadarshana Yapa yesterday justified his absence from the country during the worst floods in 14 years by insisting that the Government did its utmost to respond to relief during the disaster and so did not require his presence. Yapa, who was in Mexico to attend a conference on natural disasters, insisted that the Government apparatus, including the President and Prime Minister along with his Deputy Minister, other Cabinet members and the institutions under the ministry, functioned competently during the flooding and therefore negated any need for him to be present on the ground. “I went to Mexico to represent Sri Lanka and I was also holding the position of Co-Chairman. I knew that my Deputy Minister as well as the rest of the ministry officials along with other Government departments and the military was responding well to the disaster situation. I made daily calls to stay updated on the developments and gave instructions from Mexico. I worked hard to wrap up as soon as possible and returned four days earlier than planned,” he told reporters at the weekly Cabinet briefing. The Minister also said Cabinet had decided to immediately start demolishment of illegal construction, warning that had the cyclone not moved away from Sri Lanka it would have caused worse havoc. It is estimated that Colombo alone has 10,000 unauthorized constructions. Yapa also called for fresh legislation to punish public officials who often take bribes to turn a blind eye on illegal buildings. Yapa also defended the Meteorological Department, which he insisted released a weather update warning of rain but acknowledged that Sri Lanka does not have the necessary technology to give detailed weather prediction updates giving the volume of possible rain. Responding to a barrage of questions from the media, Yapa initially said the Government had no warning torrential rains would wreak havoc in May but then under cross questioning noted that the Government had received a warning of rain two days ahead of the deluge but insisted it had no idea the rain would be so severe, with some areas receiving more than 500 mm in just one night. During the 40 minutes Yapa was grilled by the media he also admitted that despite serious floods in May 2016 his ministry had failed to set up a mechanism to warehouse emergency supplies but claimed he did not agree with the list of supplies requested by his ministry from the United Nations. He also called on TV stations to have a dedicated weather segment to disseminate warnings faster and encourage people to be more aware of the weather. The Disaster Management Ministry has already ordered 100 boats from the Navy to be distributed to vulnerable areas, the Minister added, reiterating that more such measures would be taken in the future to improve disaster response. Yapa was also grilled on why the Government had chosen to earmark millions of rupees for luxury vehicle purchases for ministers when the funds could have been used to buy better weather warning technology for public safety. 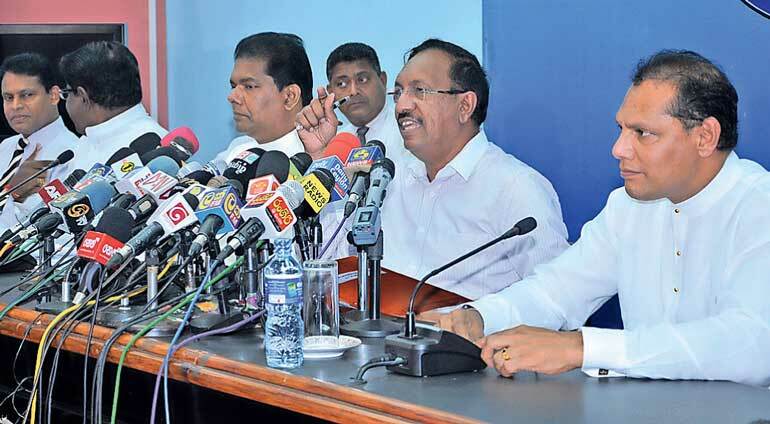 Freshly minted co-Cabinet spokesman Dayasiri Jayasekera yesterday fanned down speculation that his appointment was to sooth a rift in the Coalition Government by insisting it would instead be an opportunity for the two main parties to strengthen their cooperation. Jayasekera also dismissed allegations that his appointment would reduce the clout of Health Minister Dr. Rajitha Senaratne, who also holds the position of Cabinet Spokesman along with Lands and Parliamentary Reforms Minister Gayantha Karunathilaka. Dr. Senaratne has come under fire several times in the past for making contentious statements at the weekly Cabinet briefings, which at times had caused discomfort to members of the Government. Jayasekera was also adamant that Minister Senaratne would continue to play a key role as Cabinet Spokesman and rejected claims that his statements had caused any controversy. “None of us use the title of Cabinet Spokesman to make party statements or to promote one party over another. We are here to be the voice of the Government and to communicate Government policy to the people through the media. There is no personal advantage to doing that. It is simply a post,” he added.